Monica Zambrano Saquicela has always been ahead of the game. When she arrived to John Jay as a transfer student during her sophomore year, she immediately started taking graduate-level classes through the College’s combined Baccalaureate/Master’s Degree Program. This year, she’ll be graduating with an MPA in Inspection and Oversight, which allows her to pursue her dream of fighting international fraud and corruption. This year, Zambrano Saquicela and two other John Jay students attended the Network of Schools of Public Policy, Affairs, and Administration (NASPAA)-Batten Student Simulation, hosted at Baruch College, in order to gain an understanding of what it’s actually like to work in public administration. In a team of students from different colleges around New York, Zambrano Saquicela responded to a fictional pandemic using a computer simulation. Despite it being the first year that John Jay students attended, Zambrano Saquicela’s team won the competition. Their work will be sent to global judges that will rank it against local winners from other competition sites from all over the world. It isn’t the first time that Zambrano Saquicela has demonstrated excellence in her ability to respond to complex public administration problems. She currently sits on the executive board of the John Jay United Nations Student Association (UNSA), which has competed for over 13 years in the annual National Model United Nations event with thousands of students from all over the world. In 2016, the John Jay team earned the conference’s top honor, the Outstanding Delegation Award. 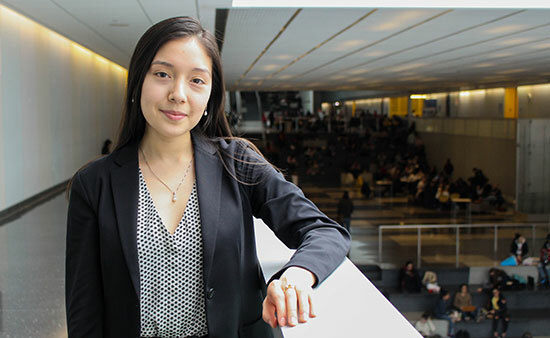 Though Zambrano Saquicela grew up in New York, it’s only because of her involvement with UNSA that she’s been able to visit the United Nations General Assembly. The experience was eye-opening in that it allowed her to understand how global governance could help people in need.